It’s official: School is back in session. Time to get the books and laptop, or tablet, and head back to the drudgery of another school year. But maybe this year you'll head back to the classroom armed with some iOS apps to help you study more easily—apps that can help you find vital information for your assignments, and apps that can help you right bettur. (See? We can all use some help.) Here are a handful of apps that can help you find useful information for school, or even for other aspects of your life. Wikilinks is an interesting way to use Wikipedia. Everyone uses Wikipedia, even though we know that it may not be the most accurate source out there. It's a good first step to finding out about a historical figure, literary masterpiece, or the geography of a country. For serious work, it's best to corroborate that information with other sources, but as a go-to site for quick facts, it's fairly reliable. You can visit Wikipedia in a web browser, or you can use the official Wikipedia Mobile app (free; iOS and Android) to view the site. It's quick and easy to search with this app, though it doesn't offer much more than the standard web experience. However, for a new twist on Wikipedia browsing, try WikiLinks ($4; iOS). This app offers full access to Wikipedia, with the ability to download articles for off-line access, and gives you links to YouTube videos for your searches. You can bookmark articles, keep a full history of everything you've viewed, and perform full-text searches easily. 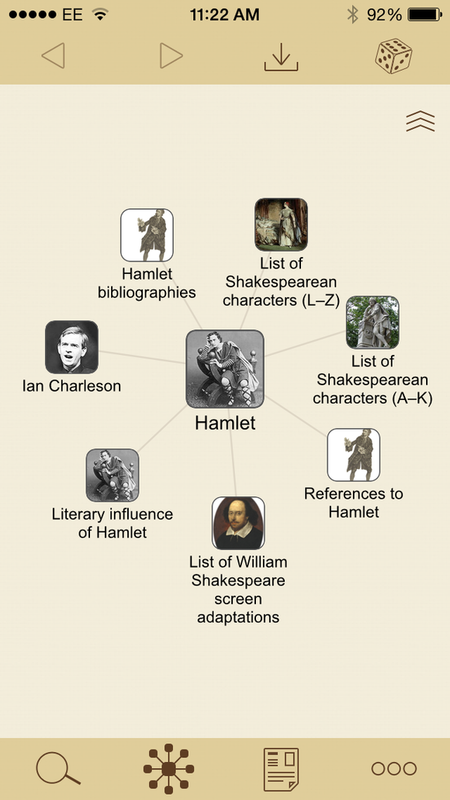 But the best part of this app is its recommendations of related articles in a mind-map. For example, when I searched for Hamlet (the play), the app offered me other, related articles about Shakespeare's characters, his editors, the literary influence of the play, and more. Tap one of these bubbles to view an article, and the toolbar at the top of the page offers links to articles in many other languages, a photo gallery, and, in this case, 200 YouTube videos, all accessible through the app. This is a great way to search Wikipedia, and go much further than you can when using a web browser. 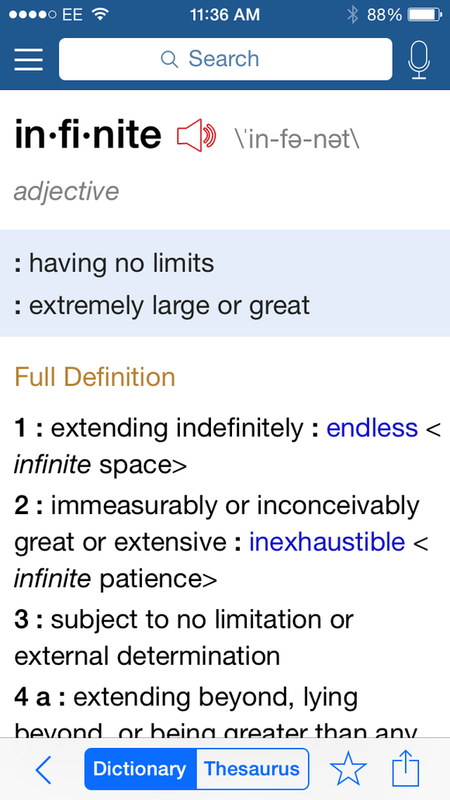 For a solid, reliable dictionary and thesaurus, the Merriam-Websters app is great. The Merriam-Webster Dictionary & Thesaurus ($4; iOS and Android) is a solid dictionary with a full thesaurus, which offers pronunciations, good definitions, brief word origin information, and if you tap Thesaurus, you'll get scans of synonyms and antonyms. It also leverages Dragon speech recognition to allow you to speak words if you don't know how they're spelled. 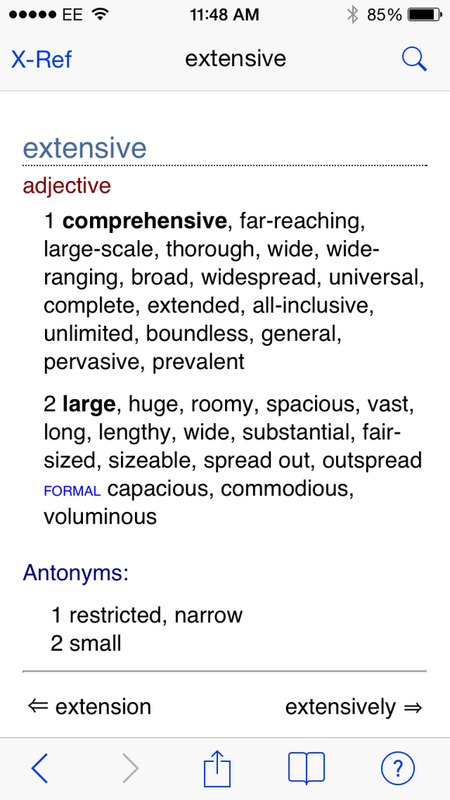 When you need more synonyms, go for a dedicated thesaurus like this one from Chambers. If you want to broaden your vocabulary, and need a more extensive thesaurus, the $5 Chambers Thesaurus ($5; iOS) offers a great fund of words, arranging them by semantic group in each entry. Its spartan interface does the job, and there are 40,000 words in this thesaurus, covering most of the terms you'll need for your writing. 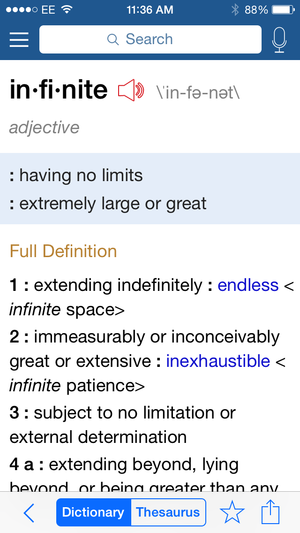 Dictionary.com Dictionary & Thesaurus Premium ($3; iOS and Android) offers ad-free access to this website's content. You can download an offline database (38 MB) to be able to use the app when you don't have an Internet connection, and Dragon speech recognition also lets you speak words to look them up. 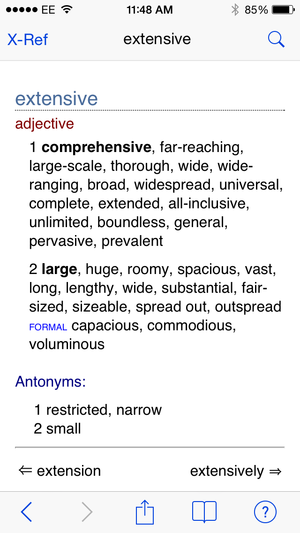 It's a good dictionary, though the thesaurus is middling. One useful feature is its learners' definitions, which are great for non-native speakers tackling English. It has some good word origin information, and it can be useful to those studying science or medicine, through in-app purchases to add specific dictionaries for those fields. Terminology 3 ($2; iOS) is a different type of app. It’s a simple dictionary and thesaurus, based on the Princeton University WordNet database, but it also lets you easily look up words on various websites, and send definitions to various targets, through its Actions menu. If you're of a geeky bent, you'll want to have a look at the Agile Tortoise website to find out how you can leverage Terminology 3. 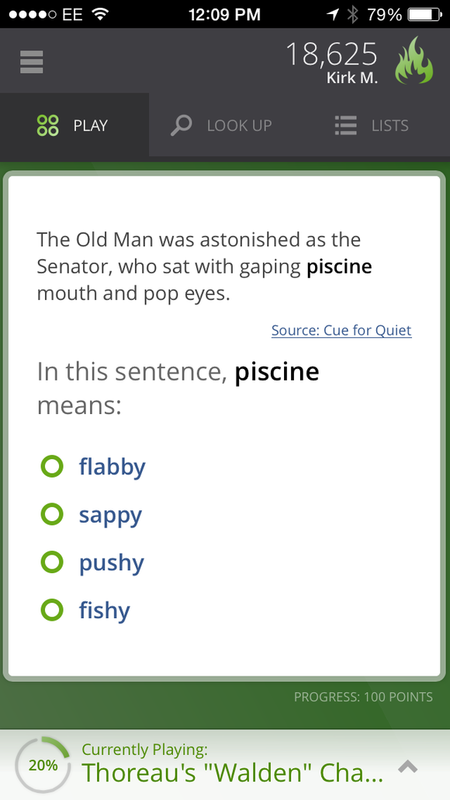 Vocabulary.com's flashcards feel more like a game than a learning tool, which is what makes it so addictive. Finally, why not make learning new words fun? I'm a word guy; I like doing crosswords and playing word games. When I downloaded the $3 Vocubulary.com app ($3; iOS and Android), I had no idea how addictive this could be. This app quizzes you on words and what they mean. You can let the app pick its own words, or choose from a number of lists of words used by specific authors, from different languages, etc. ; you can even create your own lists on the Vocabulary.com website. The app remembers the words you've gotten wrong and keeps presenting them with different examples (though sometimes you see the same ones over and over). 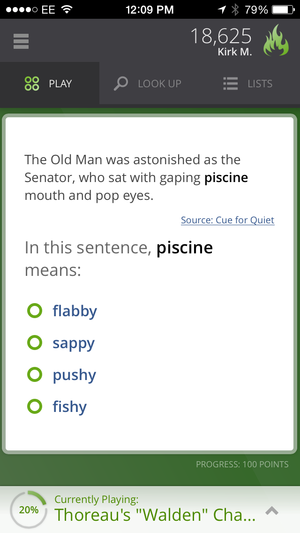 You get scores and achievements, and you can easily spend plenty of time confirming your knowledge of words and expanding your vocabulary with this fun app. So, get your synapses ready for a new school year, and use some of these apps to find out more about the world, or turn yourself into a wordsmith.